Kitchen Cabinet Depot Blog: Accent Cabinets Have Arrived! Here's an exciting new idea that is becoming very popular! Add contrast and interest by including accent cabinets in your kitchen. Just like you do in any other room, mixing up the furniture styles and colors is pretty standard. Homeowners are discovering that mixing up kitchen cabinets, your kitchen "furniture", can do the same thing. Adding a dark cabinet to a set of lighter ones wakes up an otherwise mundane theme! The problem is, where do you find great accent cabinets? 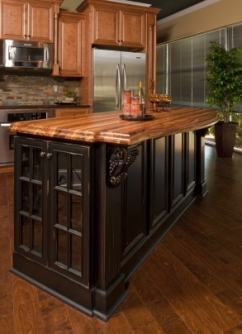 Kitchen Cabinet Depot has a great, dark onyx accent cabinet that works with nearly every style we offer! Come see and start thinking of how you can use this popular concept in your remodeling project.